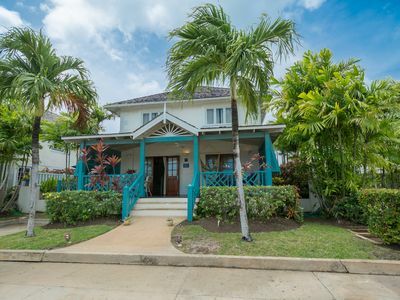 Blue Moon is a beautiful villa located in the exclusive gated development of Pavilion Grove. This small secure community houses just 6 villas. 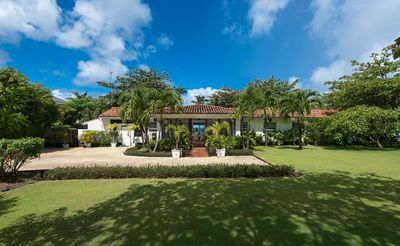 Situated on the Platinum West Coast of the beautiful island of Barbados, this villa is ideally located close to beaches and shops. 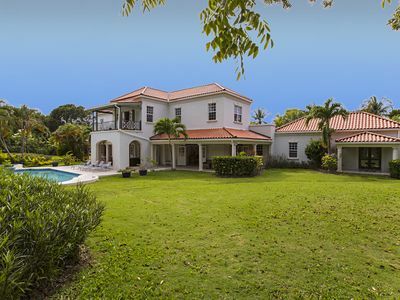 This colonial style villa has four large bedrooms, suitable for sleeping up to 8 people. 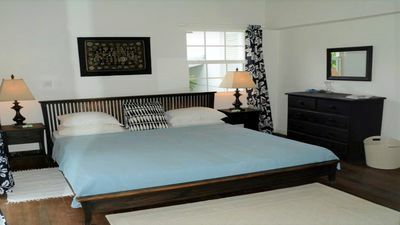 There are three bedrooms located on the first floor each bedroom has its own individual and spacious ensuite bathrooms. There is a large double room located on the ground floor, which can be made up as two single beds depending on your requirements. This bedroom also has a spacious bathroom. Hairdryers have been provided in the bathrooms. The modern kitchen is fully fitted with marble countertops and SMEG kitchen, and is well equipped for all your holiday catering needs. 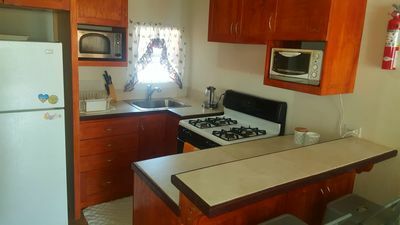 There is a large fridge/freezer, oven, cook top, microwave, blender, coffee machine, toaster, dishwasher and an array of tableware and utensils. There's a separate laundry room complete with washing machine and tumble dryer. The sitting room has comfortable seating for 8 people, and has a television, cable TV and a DVD player. 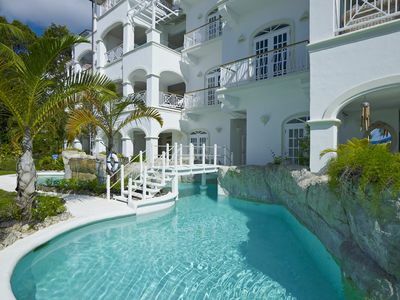 The villa also has Wi-Fi and telephone with free local calls. The dining area has a fine table and chairs. 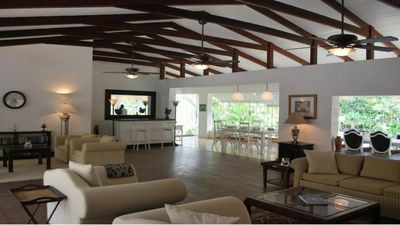 The villa is fully air-conditioned. 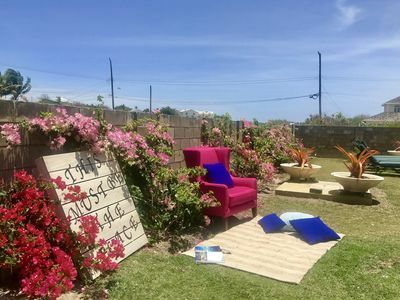 The entrance to Blue Moon has a covered veranda with a small dining table and a relaxing area with patio chairs and hammock; perfect to relax with your morning coffee or a sundowner in the evening. 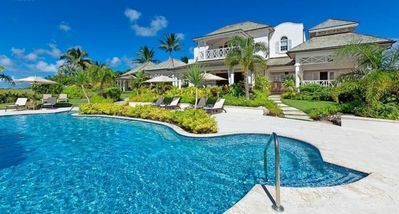 The outside area of the property features a plunge pool (13ft x 10ft), which is just great for a quick dip to cool down from the hot Caribbean sun. There are sun loungers and parasols provided on the outdoor decking. 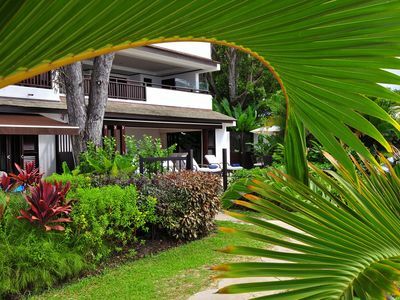 Fry up some local fish on the gas BBQ located on the outdoor decking and enjoy the evening from the comfort of your villa. There is off road car parking available at the property. 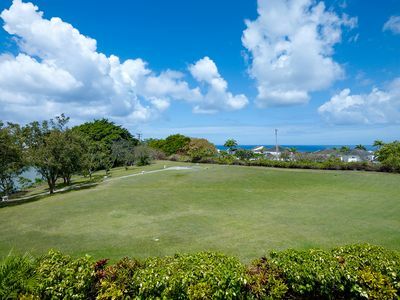 A car rental is an easy and convenient way to explore the island. We are happy to provide quotations for a car rental for the duration of your stay. 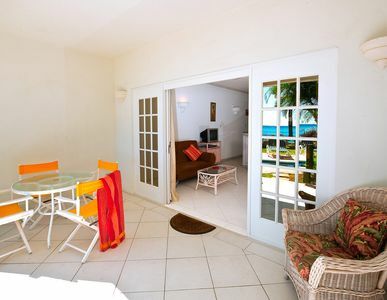 Blue Moon is located just a short 5 minute walk from the closest beach - Alleynes Beach. 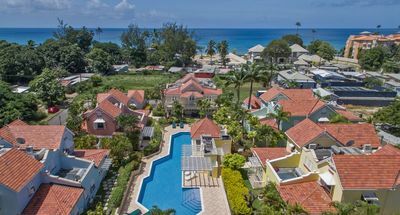 Alleynes beach is the home of the famous Fairmont Royal Pavilion and Lonestar Restaurant. 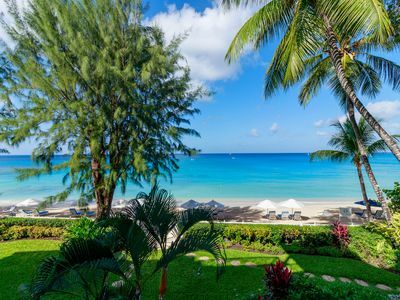 Guests of Blue Moon receive complimentary Beach Club Membership cards for the Fairmont Royal Pavilion Hotel to use for the duration of the stay. 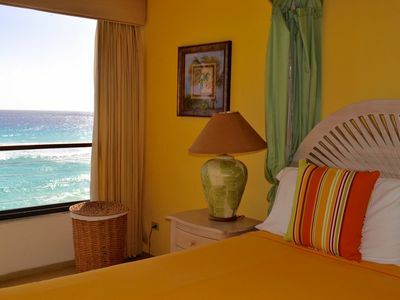 The Caribbean Sea is generally calm and welcoming, and ideal for swimming. 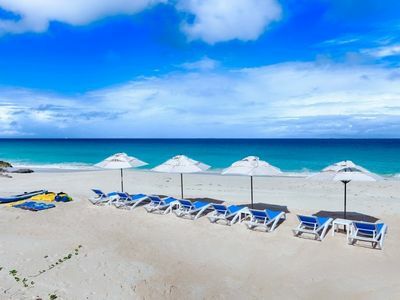 There is a beach bar perfect to grab a cooling drink or watch the sun slip away with a cocktail and all watersports are available to try. The closest shops and banks are located in Holetown, about 5 minutes by car or bus. Buses run frequently along the main coast road. 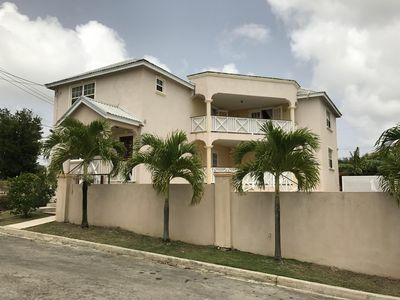 In Holetown you will find a supermarket, banks, and a post office as well as a 24/7 medical facility. There are lots of restaurants and bars catering to all tastes and budgets; from fine dining to road side eateries. Holetown has its own beach, with two beach bars. 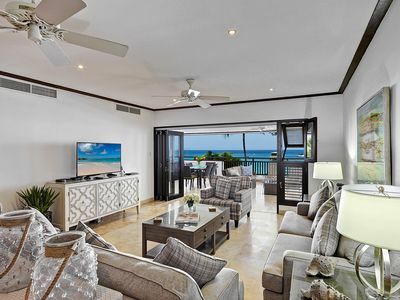 Holetown is home to the only luxury shopping mall on the island – Limegrove, where you will find a selection of designer shops, restaurants, bars, trendy cafes and duty free shopping - even a cinema, all under one roof. Blue Moon is a family friendly property and we can provide a cot for little ones. We want you to have the best holiday experience from start to finish, and so that you can enjoy a stress free arrival and departure, we provide complimentary airport transfers with our private driver (applies to stays of 7 nights or more). We provide a full concierge service to our guests both before they arrive and during their stay. We are on call 24/7 to help and offer advice. 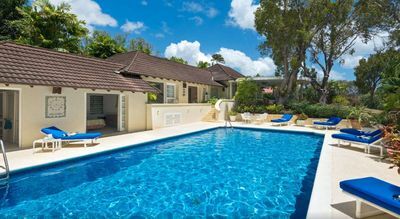 Blue Moon is a comfortable and luxurious property for your stay in Barbados, making it the perfect holiday home from home. Ascot House Villa 3 .